In today's culture, almost every teenager and adult owns and uses cellular phones on a regular basis. Smart phones and PC tablets give people options for instant communication to the outside world. People rarely venture anywhere without this technology at hand. This technology, along with GPS are essential to the way we communicate. Cell phones and Tablets help us to communicate, offers a sense of security, and helps us to find information virtually and instantly. In public, it is common to see someone using their Cell Phone or a Tablet in almost every setting. While most people carry their device in their pocket or hand bag, there are many instances where cell phones and Tablets are not allowed. Cell phone lockers are a perfect solution to store a cell phone, wallet, digital camera, keys, and many other small valuables. Cell phone lockers are fabricated from aluminum and with locking doors, are a convenience that will protect the owners personal items from theft or damage. Many establishments use them to keep their employees from distraction, hence providing a more productive work environment. 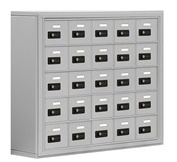 Government agencies use these locking lockers to regulate personal items such as cell phones to prevent security risks or breaches by outsiders. Modern society, and in many facilities, cell phone use is regulated. You may have encountered a School or Government Office where these devices are not allowed. Government agencies, schools, and businesses in the private sector may ask you to store your personal devices in a phone locker. Businesses in the private sector may not allow personal computers, tablets or cell phones use while in the office. Some establishments ask you to check them at the door. As a result, smaller lockers to accommodate personal devices have been conformed to secure these personal devices. Phone lockers vary in size and number of personal compartments depending on the number of visitors or employees these lockers are required to accommodate. Units are available in five configurations from 10 door to 25 door configurations. Locker units are fabricated entire of aluminum. Each personal compartment has a secure locking door that is equipped with a keyed lock or option for a resettable combination lock or combination lock, depending on the business plan. Peace of mind. 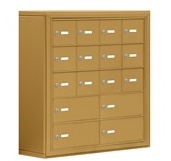 Your personal devices are secure when stored in a secure locking cell phone locker. Theselockers are normally installed secured to a wall, recessed into a wall or pedestal mounted. Government agencies, schools and business generally have secure and designation locations where you can store you personal device. While on the job, in school or where some forms of security is necessary these units are ideal for everyone. Do not hesitate to check your cell phone into a phone locker equipped to secure your personal items with confidence while at your spa, work or where required. Rest assured that your personal items will be safe, dry and secure from theft or damage while you cannot have your device at hand. Return with assurance that your personal things are the same as you left them so you can get back to your personal routine and relationship with today's technology.